One of the highlights of our swing through Northland was definitely our exploration of the Kauri Coast. This part of the west coast was so named for the huge trade in Kauri timber and gum (like amber/resin and used for industrial purposes) in the 1800's. The Kauri trees are the ancient giants of the New Zealand forests. Once covering much of the country, there are now only a few remnants of the Kauri forests left on the west coast. The obvious parallel/reference for the Kauri trees for us North Americans are the Redwoods or the Sequoias. With the images of these massive towering trees in my head I was a little let down at first sighting of some of the famous big Kauri trees. They are neither as big as the Sequoias or as tall as the Redwoods. However once I started to see them for what they had to offer, I was entranced. Kauri grow up with perfectly straight, smooth trunks. At a certain point they stop growing up and just focus on growing out/expanding their girth. At the very top/crown the branches all spread out, creating a crown full of birds and supporting epiphytes and other plants and towering over the rest of the trees in the forest. 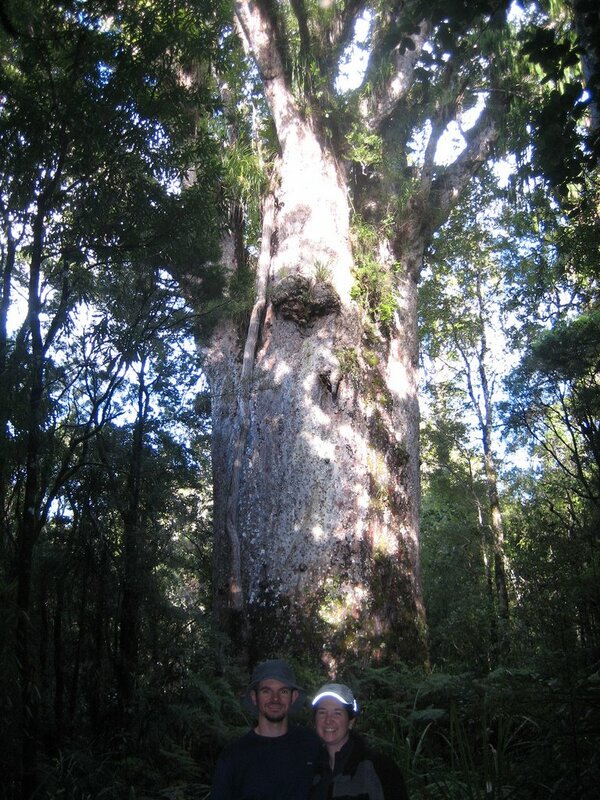 A kauri can grown up to over 180 feet and have a girth of over 80 feet. Unfortunately, none of these behemoths remain. The two oldest and most revered trees left now are in the Waipoua Kauri forest. The largest/tallest tree is Tanemahuta (The God of the Forest) with a height of over 150 feet. It is estimated to be between 1200-2000 years old and towers over the rest of the trees in the area, sticking out of the canopy like Bo Peep above her sheep. Even more impressive is Te Matua Ngahere (The Father of the Forest which, though shorter than Tanemahuta, has a trunk over 15 feet in diameter and at approximately 2000 years old is the oldest Kauri tree known to be surviving. Most of the Kauri trees you see in the forest here are just youngsters in comparison, but even so as you look through the forest with these unreal-looking huge straight trees you feel like you might at any moment see dinosaurs, or at least Moas (the extinct giant birds) and Maori hunting parties. There really is that sense being of all of a sudden in a time warp. And just like walking through the redwood 'cathedrals' can be a spiritual experience, no matter what your persuasion of belief or non-belief, so it was walking through these forests. One of the best parts of our visit to the Kauri forests was going on a night-time guided nature walk in the Trounson Kauri Forest (another smaller reserve in the area). Trounson has an active predator eradication program going and because of that has been successful at nurturing a small population of kiwis. Kiwis, the national bird of New Zealand, are rare, shy, and nocturnal, so even most New Zealanders have never seen ones in the wild. Well, 37 seconds into our walk and kapow: there caught in our red light was a male kiwi searching for food in the grass. We all stood there giddily watching him until he waddled off back into the forest. In the course of the next 90 minutes we saw kiwis two more times, as well as huge river eels, cave wetas, kauri snails, catfish-like fish, glow worms and a scary-looking big spider. In addition to seeing all this wildlife (most of which are nocturnal and not to be found if you're exploring in the day), our ears were ringing with the cries of several other kiwis (a hugely spooky sound if you don't know what it is) and the morpork (a native owl). Add in the glorious stars (with glowing milky way) and the informative and folksy commentary from our guide, Herb (a retired mechanic who has become quite knowledgeable in this new role) and it was a fantastic evening, easily one of our favorite moments in New Zealand. For those in the area interested in getting this experience, contact Herb or Heather at the Kauri Top Ten Holiday Park near Trounson Forest (0800-807-200). Trust us, you won't be sorry.